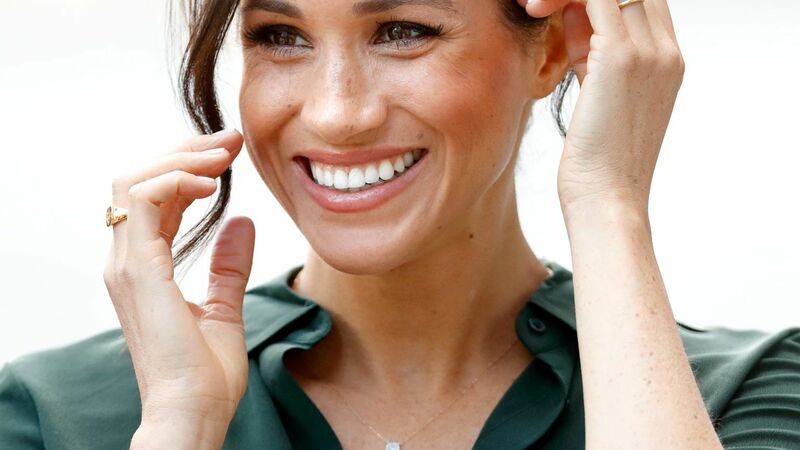 Pregnancy hormones work for the Duchess, because the Markle sparkle is brighter than ever—but there's more to her glowing skin than that. If you want your skin to glow like a royal, you can't skimp on the moisturizer. Dry skin shows discoloration and redness, while plump, hydrated skin gives a youthful glow. Meghan is a noted fan of the Kate Somerville Quench Hydrating Face Serum ($75; sephora.com). This hydrating and pollution fighting serum no doubt helped create "the Markle Sparkle." She also makes sure to hydrate all over with the Nivea Skin Firming Body Lotion ($19; amazon.com). "I use this religiously," Meghan told The Lady Loves Couture. "It’s honestly my favorite lotion on the market, it’s so affordable, and makes my skin look and feel amazing. I would buy a case of this at a time if I could find it." At Home Glow: As temps and humidity levels continue to drop, moisturizer is a must. If the Duchess's fave hydrator is a little too pricey, the Olay Regenerist Whip Facial Moisturizer ($29; target.com) is a more budget friendly option. Apply after cleansing and exfoliating at least twice a day to help reduce the development of fine lines and create a smooth base for your makeup. Following her pregnancy announcement, we can't help but notice Meghan Markle's glowing skin, not to mention the fact that the first trimester hasn't slowed her down one bit. 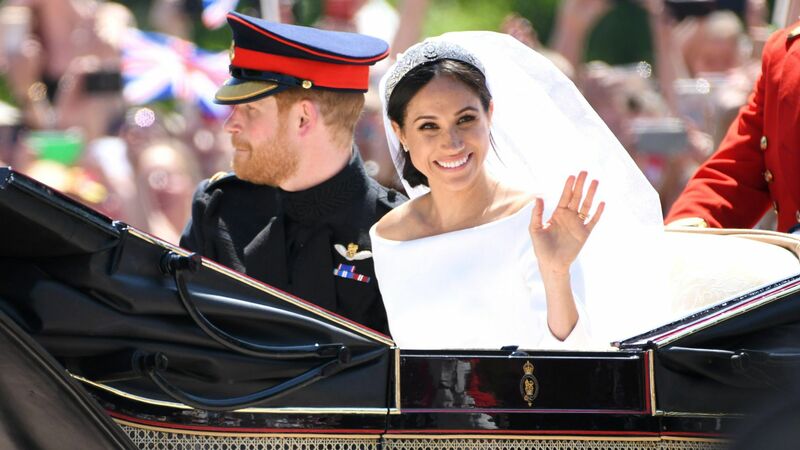 Obviously, pregnancy hormones work for the Duchess of Sussex, because the Markle sparkle is brighter than ever. But there's more to her glowing skin than hormones. For example, what highlighter is she using? How much does she exfoliate? How much time does she spend on her skincare routine? While we may not know much about the royal baby yet, these questions happen to fall under our area of expertise. 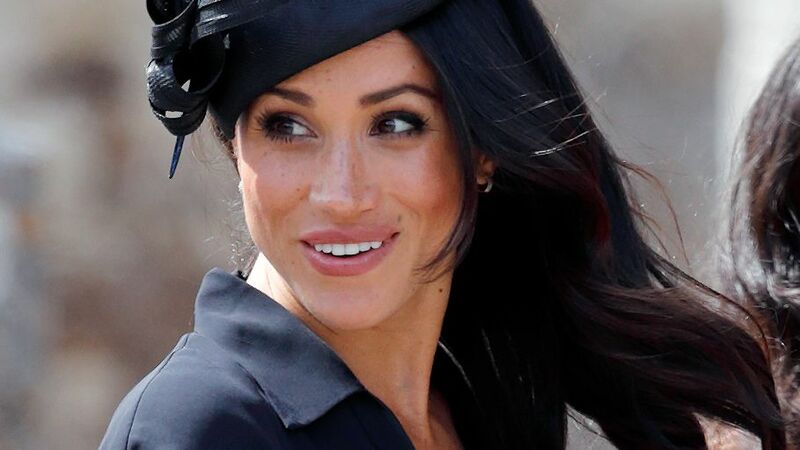 The Duchess of Sussex Eats a Diet that Promotes Healthy Skin. In a previous interview with Delish, Meghan recalled how much better her skin looked on camera after she cut out gluten while filming Suits. Not ready to committ to a gluten-free diet? Don't worry, neither is Meghan. 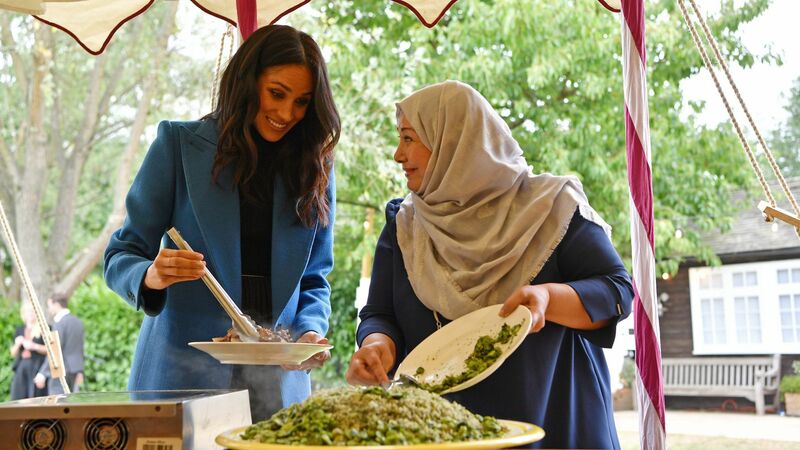 "When I'm traveling, I won't miss an opportunity to try great pasta," Markle revealed to Delish. "I come back from vacation every year with a food baby, and I've named her Comida." Cutting out gluten isn't her only trick. In that same interview, the Duchess also revealed that almonds are one of her favorite snacks. Loaded with Vitamin E and plant proteins, these nuts are more than just a healthy snack; they're also good for your skin. At Home Glow: If you aren't ready to break up with bread entirely (we don't blame you), just try to limit your intake. Next time you want pasta, go for spaghetti squash instead of noodles. Try replacing some of your carb-heavy snacks with some lighter, healthier ones. Skinny Dipped Almonds ($4; target.com) are a favorite in the Real Simple office. She Takes Her Skincare Routine Seriously. In order for your glow to show, you need to have a clear canvas—something the Duchess takes very seriously. In an interview with Allure, Meghan revealed her tried and true exfoliator. "I really love the Tatcha Rice Enzyme Powder ($65; sephora.com)," she said. "It just sort of foams on your face and gives you a really subtle exfoliation." Regular, gentle (to ensure skin doesn't get irritated) exfoliation is necessary to remove dead and dulling skin cells that prevent brightness. In addition to exfoliation, Meghan also mentioned being a fan of Jan Marini skincare products. "I've been using their serum lately," she said. "It's a nice glycolic one that makes your skin really glow-y." Bingo. At Home Glow: If cleansing and exfoliation are not a part of your regular skincare routine, it's time to incorporate it. The Indie Lee Brightening Cleanser ($32; sephora.com) is loaded with antioxidants and vitamin C removes makeup as well as enhancing skin's natural luminousness. Pair that with your favorite exfoliator (or Meghan's) to prep your skin for an all day glow. Meghan Markle Doesn't Just Use Moisturizer on Her Face. If you want your skin to glow like a royal, you can't skimp on the moisturizer. Dry skin shows discoloration and redness, while plump, hydrated skin gives a youthful glow. Meghan is a noted fan of the Kate Somerville Quench Hydrating Face Serum ($75; sephora.com). This hydrating and pollution fighting serum no doubt helped create "the Markle Sparkle." She also makes sure to hydrate all over with the Nivea Skin Firming Body Lotion ($19; amazon.com). "I use this religiously," Meghan told The Lady Loves Couture. "It’s honestly my favorite lotion on the market, it’s so affordable, and makes my skin look and feel amazing. I would buy a case of this at a time if I could find it." At Home Glow: As temps and humidity levels continue to drop, moisturizer is a must. If the Duchess's fave hydrator is a little too pricey, the Olay Regenerist Whip Facial Moisturizer ($29; target.com) is a more budget friendly option. Apply after cleansing and exfoliating at least twice a day to help reduce the development of fine lines and create a smooth base for your makeup. She Chooses the Right Makeup for Her Skin. 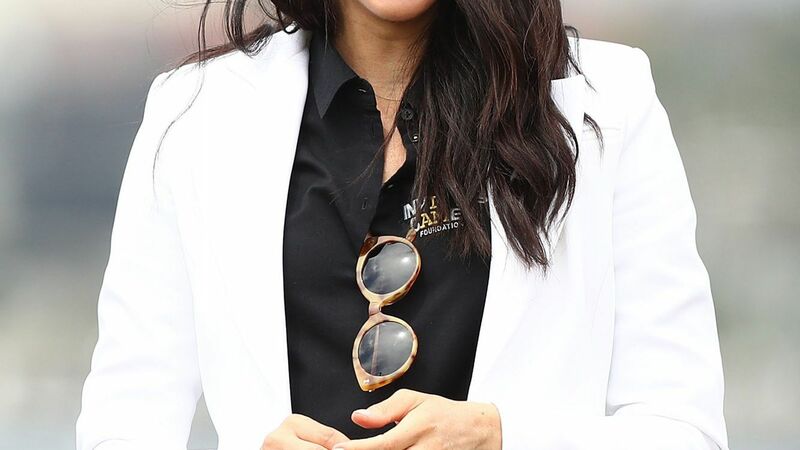 At Home Glow: If a simple primer isn't going to cut it for you, Meghan's former makeup artist Lydia F. Sellers told Refinery29 her favorite foundation to use on Meghan when she played Rachel in Suits was the Armani Luminous Silk Foundation ($64; sephora.com). When applied with a beauty blender ($18 for two at sephora.com) it creates flawless, luminous skin immediately. Be conservative with how much you use. "It was more about the amount of product that went on her skin and keeping it really fresh and dewy, rather than caking it on," Sellers told Refinery29. Adding too much reduces your skin's natural shine. The Duchess Uses the Perfect Finishing Touch. The moment you have all been waiting for: the highlight. Despite her royal schedule and a constant team of papparazzi, Meghan's perfect highlight remains constant. According to Elle.com, Meghan's makeup artist, Daniel Martin, used the Dior Backstage Contour Palette ($45; sephora.com) to create a timelessly chic glow on her wedding day. At Home Glow: For a natural looking highlight, lightly dust the powder onto the top of your cheekbones and up toward the temple. Add a little to the cupid's bow—the middle of the chin and between the eyebrows. Don't have a highlighter on hand? Not to worry. The Duchess's cost efficient highlighting hack makes glowing skin possible for everyone. Martin gave Hello! the scoop: Instead of using makeup, dab on a bit of Aquaphor Healing Ointment ($7; target.com), he explained. "When you think about it, using skin-care in lieu of makeup makes sense. For one, you're adding hydration to the skin, rather than potentially clogging your pores. And, glowing skin is simply the appearance of very healthy and moisturized skin. Aquaphor will give you that same texture, especially in a photo when applied on the high points of the face."